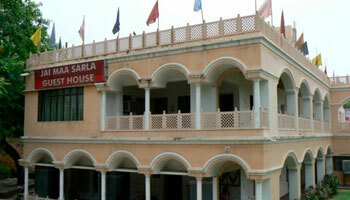 Established in year 2000, Jai Maa Sarla Guest House is at a short distance from our Hotel Amba Inn. Additional to the hotel service we provide,we also specialize in weddings, banquets and parties in our guest house. It has 10 big rooms, with two big lush green gardens to serve the purpose for any social gathering at affordable prices. Parking, Travel Counter, Security Guard, Room Service, Backup Generator, Currency Exchange, Breakfast Services, Airport Transportation, Doctor on Call, Laundry Facilities. DVD Player, H/C Water, Toothbrush/Razor on Request, Attached Bathroom, Wakeup Calls, House Keeping, Cable/Satellite TV, Iron/Ironing Board, Air Conditioning Room.